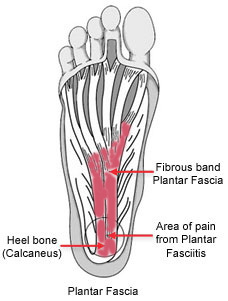 Plantar fasciitis (arch pain) is due to overuse of the flat band of connective tissue that connects your heel bone to your toes. This band becomes overstretched due to excessive training, walking or being on your feet. Plantar fasciitis is seen more in those with excessive pronation of the feet (rolling in of the feet while walking) and those with flat feet. A good pair of orthotics that properly support the arch is extremely important. If you take your orthotics out of your shoes and place them on the ground and stand on them your medial arch should have NO Gaps between it and the orthotics. If you do have a gap you are in the wrong orthotics. Also, orthotics that are too soft wont support the arch properly either. You need an orthotic that will limit the amount of pronation or rolling in of the foot with each step as this put to big of a load on the arch. Once you are in the right orthotic you can now limit further damage and now it is time to lengthen the shortened Plantar fascia. This can be accomplished with High Power Class IV Laser Therapy and Active Release Technique. The two therapies combined will decrease swelling, inflammation, scar tissue, fibrotic adhesions, pain and lengthen the once shortened Plantar fascia. Ice baths should also be done 1 or more times a day at home to reduce swelling and inflammation. Once the pain is reduced you can return to activity but at a much reduced and humble level. Exercise should be performed on an every other day basis with NO back to back training days. Exercise can be increased at no more than 5-10% per week to reduce the chance of a flare up.